So, I have officially had the hiccups for around 24 hours now. Not going to lie, starting to drive me nuts. But, at least the *Colts just scored*. 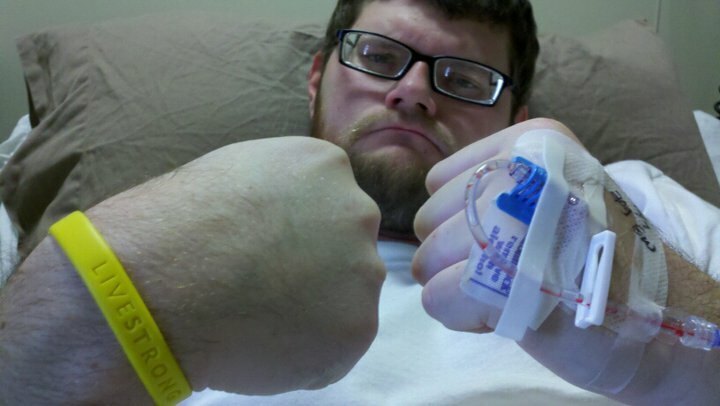 Everything went well during treatment today, and I am getting my port removed first thing in the morning (finally!!). This week, despite all the hiccups (no pun intended) has flown by. I think it's because of the fact that I have a new attitude, as well as a new found confidence in God to help me get through this. Philippians 4:13 says, "I can do ALL things through Christ who strengthens me" *Colts score again*. And through Christ and the support of my family and friends, I WILL beat this. Well, have a good night and thank you all for your continued support. They've scored twice! The Titans make this too easy! Lincoln and I are thinking of you, bud. Hope everything goes smoothly. That pic alone should scare the crap out of TC!! Much love and support buddy! !